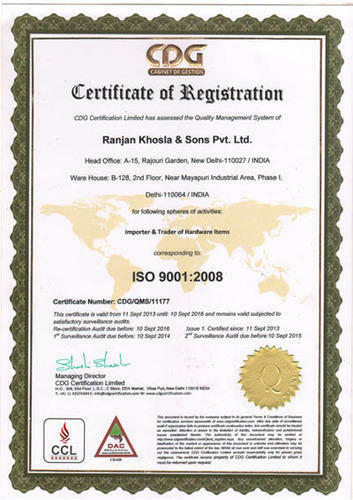 We are an ISO 9001 : 2008 Certified Company, MARSUN have the foremost priority of maintaining and international standards in all of our products for a delightful customer's experience. Such a resolute foundation makes us a globally trusted name when it comes to quality and customer satisfaction. We endeavor to supply high quality kitchen hardware, accessories and wardrobe accessories at very competitive prices. Strict quality checking takes place in our workshop right from the selection of raw to manufacturing to final delivery and only those products which confirm to the accepted norms and standards of national and international standards are accepted to be supplied to our customers both within and outside India. The infrastructure setup at Ranjan Khosla and Sons Pvt. Ltd. is impeccable with all the required facilities present in abundance to ensure smooth and uninterrupted flow of production. We incorporated the most innovative and state of the art technology which aids in rapid pace of production. Our workforce is a team of highly skilled and dedicated employees who have a knack to always make great strides to this field through their extra efforts and initiative. Timely delivery of these products is ensured with the presence of a capacious warehouse with the ability to store huge stock of the products and thereby meet all the requirement of the customers efficiently.